Did 'zero-tolerance' policy reduce illegal immigration? By Miriam Valverde on Thursday, July 19th, 2018 at 9:11 a.m. The Donald Trump administration billed its "zero-tolerance" immigration policy as an escalated effort needed to address a "crisis" at the border, even though apprehensions were at their lowest point in decades. In its release of June border data, the Department of Homeland Security credited the policy for a dip in migration numbers. But immigration experts said the success of one policy change is unclear with just a month’s worth of data. There is a long pattern of southwest border apprehensions declining from May to June. Immigration officials made 34,114 southwest border apprehensions in June, a 15 percent decline from 40,338 in May. That’s in line with a long-standing trend. Border Patrol data shows that June apprehensions have been lower than May’s every fiscal year since 2000, with the exception of 2017. DHS spokesman Tyler Q. Houlton pegged a decline that’s slightly bigger in a July 5 news release: "Following the implementation of the administration’s zero-tolerance policy, the June 2018 Southwest Border Migration numbers declined by 18 percent when compared to the previous month." The 18 percent decline accounts for border apprehensions and inadmissibility numbers. Apprehension data is a way of tracking illegal entry, while inadmissibility is a metric of people seeking, but denied, lawful admission at ports of entry. U.S. Customs and Border Protection, the agency within DHS responsible for border security, noted in its website that the May-June decline "follows the overall downward trend for this time of year." A narrower look at the data also shows that the number of family members apprehended in June compared to May wasn’t significantly different. There were 9,485 in May and 9,449 in June. 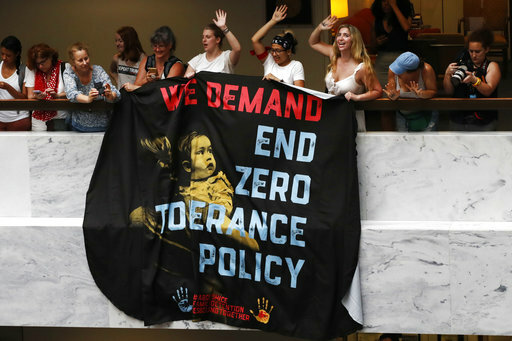 There still isn’t enough time or data available to judge the impact of the "zero-tolerance" policy, said Steven Camarota, research director at the Center for Immigration Studies, a think tank favoring low-immigration levels. "The May to June drop doesn't look all that remarkable," said Jacob L. Vigdor, a professor of public policy and governance at the University of Washington. Broad shifts in policy, changes in the number of migrants intending to cross the border, and the Border Patrol’s effort or success from month to month can all impact the fluctuating apprehension numbers, Vigdor said. "While some might look at that May to June drop and say it's a sign of the administration's success, others could look at the same data and note that the last four months — March through June — represent the four highest apprehension totals since Trump took office," Vigdor said. Pew Research Center analyzed apprehension data for family members and found that more family members were apprehended this January to June period than any other January to June span since at least 2012. Most of the social science research on the border has confirmed that the decision to come to the United States illegally is driven by factors such as economic and political conditions and violence, not by changes in U.S. immigration policies, said Everard Meade, director of the Trans-Border Institute at the University of San Diego. Regarding the administration’s claim of a crisis at the border, "there's no empirical case for it," Meade said. Overall, fewer people are trying to get in than in recent years, and there are more resources and personnel securing the border, Meade said. "When we say something is a crisis, that creates a pretext for setting aside our normal way of debating an issue, but also creates an excuse for not following common procedures," Meade said. In a June 6 statement reporting an increase in illegal crossings from April to May, DHS said it will take time and help from Congress to reduce illegal immigration. "No one expects to reverse years of political inaction overnight or in a month," Houlton, the department spokesman, said. "It is also clear change will take more than administration action alone."